If you want to find a game that your kids will ask to play again and again, then The Reading Game is one to choose. The best part is, you will also be doing school at the same time! At least that is the case for us! Sarah, who is 8, loved the reading game and so did her brother, who is 10! This would be a great gift to put under the Christmas tree especially for beginning or struggling readers. The Reading Game was created by “Wordly Wise” author, Kenneth Hodkinson. On completing the series, the student has a reading vocabulary of 180 words. It is very simple to set up and begin play. The game consists of six books with decks of matching cards for each book. Each deck of cards consists of six sets of 5 new sight words for your child to learn. Each book is about an animal beginning with a skunk. First, you may want to test your child to see which level of book you would like to start at. There is an assessment worksheet available here. We began with the beginning cards and book. Here is a video explaining how the game works. We played the matching game first. Each time a card was turned over, Sarah would say the sight word. Stephen knew these words very well already so he still played with her but she always said the words. They would play the game twice a day until I felt that she could say all the words and then I used this sheet to make sure she knew them all. She really wanted to get to the final stage which was reading the book! She did really well with these and knew a lot of the words already so this was awesome reinforcement for her as well as her brother! Dolch Word List of “service words” (pronouns, adjectives, adverbs, prepositions, conjunctions, and verbs) that cannot be learned through the use of pictures. 60% of the words in “The Reading Game” are on the Dolch Word List for pre-k and k and makes up 54% of dolch words for Pre-K, K and 1st Grade. This would be a great supplement to your reading program! You can purchase The Reading Game here for $24.95 + shipping. Don't forget to check out what my fellow crewmates thought of The Reading Game. **Disclaimer: I received a free sample of this game in exchange for my review. The opinions here are my honest and true evaluation! 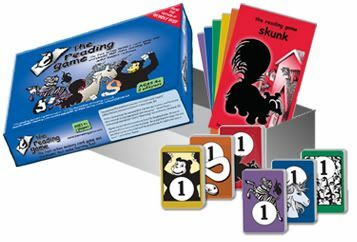 You very kindly reviewed The Reading Game back for us in the fall of 2011 through TOS Homeschool Review, when it first came out. We are now about to launch the 2nd edition which is updated and enhanced based upon parent and teacher feedback. This new edition will add a set of picture flashcards to help in the transition from stand-alone words to short sentences and phrases, as well as introduce capitalization and punctuation in the flashcards and storybooks. Since its initial release, the game has won four awards, including the Dr Toy and Tillywig Brain Child of the Year Award. To help raise funds for the 2nd print run and raise donations for children in need through the non-profit, First Book, we launched a crowd-funding Indiegogo.com campaign yesterday - "Give the Gift of Early Literacy". Through this campaign, backers can receive a discounted, pre-release copy of the new second edition of the game, or help a child in need by donating as little as $1 or even just by sharing the campaign with others. In order to be successful the campaign needs as many supporters, shares, tweets, links, etc. as possible. Would you mind sharing this link - statement with your readers? Get your hands on a DISCOUNTED pre-release 2nd, enhanced edition of The Reading Game through this Indiegogo.com crowd funding site. Or for as little as $1 donate a game to a child in need through First Book.